Lately, I have been lazy. I want to get out of the kitchen quickly and if my husband is reading this post he will probably roll his eyes and say “ Tell me something new!”. We wait for weekends and then there is a long list of chores that need to be done – laundry, grocery, cleaning, cooking.. getting a wholesome lunch cooked is definitely higher in priority than making dessert. 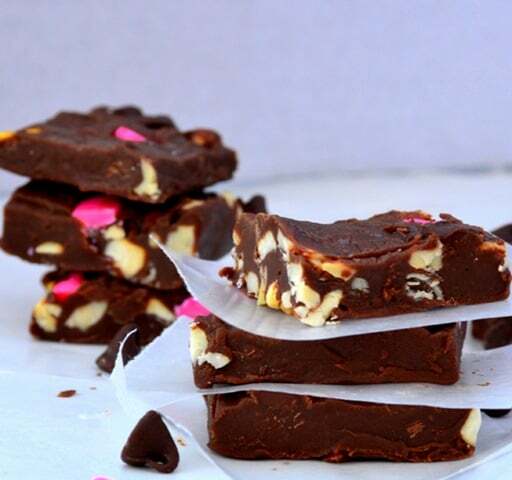 This recipe for Microwave Fudge is for one of those weekends when you want a quick dessert but don’t have a whole lot of time in your hands. All you need is 5 minutes and a little bit of setting time and this dessert is ready sooner than your load of laundry. Recipe credit goes to my daughter who went through my magazine clipping archives and found this gem from an old clipping of Food Network Magazine. This recipe for Microwave Fudge is for one of those weekends when you want a quick dessert but don’t have a whole lot of time in your hands. Microwave chocolate in a bowl for 20 seconds. 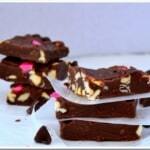 Stir and continue to heat in the microwave in 10 second intervals till most, but not all of the chocolate is melted. Stir the chocolate until it is smooth, shiny and completely melted. (Took me about 30 seconds). Add condensed milk to the melted chocolate mixture and stir well. Microwave for 2 minutes and stir vigorously. Microwave for another 2 minutes and then add chopped nuts and mix well. Spread the mixture in an 8-inch square pan lined with parchment paper. Add the colored chocolate chips (if using) evenly on top of the mixture and gently press them in using the back of the spoon. Refrigerate for an hour and then cut into squares.